I haven't been listening to the pirates a great deal during the last few weeks, mainly because history tells me this isn't a good time of the year to tune in. The long hours of daylight and poor propagation conditions are never a good mix. However, with yesterday being the longest day of the year there is plenty to look forward to. Not that I'm wishing away the summer, but the days will gradually shorten, the hours of darkness will increase and the chances to listen to the Dutch MW pirates will become more plentiful. When I turned the radio on this evening I thought conditions were even further down than I imagined. I could literally catch only the very odd weak signal. It took me a good ten minutes to realise I had disconnected the outdoor loop antenna during one of last week's storms! It seems there is a deal of bad weather somewhere not too far from here again as the static tonight is as bad as I can recall in a good while. 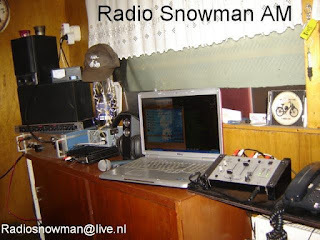 That is not stopping Radio Calimero from powering away on his usual frequency of 1638 kHz with another of his lengthy broadcasts, while on 1620 kHz is the tiny transmitter of Radio Snowman, whose signal from Friesland is pretty good. Also on the air right now is Radio Turfsteker. He's on 1645 kHz and runs only around 50 watts. Again, the signal is pretty good all things considered. Now if only the static crashes would disappear, listening conditions would be great.